Hunter Valentine is a Toronto-based rock act formed in 2004. They are made up of Kiyomi McCloskey (lead guitars, vocals), Laura Petracca (drums), Veronica Sanchez (bass) and Aimee Bessada (guitars, keyboards). 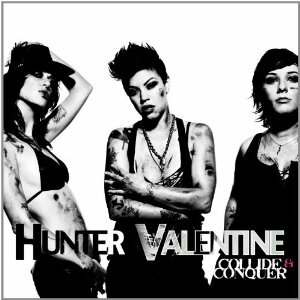 Earlier this year, Hunter Valentine released their second album, Collide and Conquer, and were featured on the Showtime series The Real L Word. They've also been touring North America extensively and Noisecreep recently had a chance to catch up with McCloskey to talk about the rigors of the road, among other things. Just as we were getting ready to go live with this piece, the band announced a string of U.S. West Coast dates opening for Sum 41. How's the tour been going, Kiyomi? It's been a very successful tour. We've had a lot of shows sell out, most sell out or are close. We're getting a lot of new fans and we're really happy. This one leg itself has about 70 dates on it so it's pretty long. Do certain parts of the U.S. seem to understand the band more than others? When we first started touring the U.S., I was more sensitive to how we might go over down south or like in Texas but those have become some of our best markets. Honestly, the response is just excellent all over, but really strong down south. We're headed down there right now in fact. What's tough for you in terms of being on the road? It take a lot of stamina to give it everything we have night after night. We're on a 70+ date tour so we have to remember that every single show counts, everyone has paid for tickets and they deserve to see the same kind of energized show as the last one. So the energy is important. One of the hardest things these days is, you get to s show, you set everything up, you do the show, give it everything you got, then we sign for an hour or two, but the toughest part at the end of it all is loading all the stuff out. I think it's time for a roadie. You do all of that yourselves with no help? We have a tour manager and she does all the merch all the scheduling and a lot of the driving, but we all carry everything at the end of the night. Ever think of getting fans to help? Sometimes we do that but we're really more hesitant because that's how things usually get lost. Do you find that it's still sort of a guy's world out there on the road? There are fewer female bands but still, it's whatever world you create and whatever you make of it. We've created good surrounding for ourselves, we have lots of male supporters, but most of our business team are women, our agents, the person that signed us – we call it Team Ladykiller. Was there a show you saw growing up in Canada that inspired you way back? Not a rock show. But I've seen Lucinda Williams for a long time, and I love her. The way she can command an audience is really profound to me and captivates me. She helps me realize the power of songwriting and how that translates into a performance. Hunter Valentine's latest album, Collide and Conquer, is available now on iTunes.